Abraham Lincoln would be embarrassed about the polarization of U.S. politics today, 150 years after his assassination. Make no mistake, Lincoln was a polarizing president. His election was the pretext for secession by southern states. He refused to compromise even as the magnitude and duration of the Civil War grew. 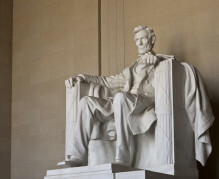 But Lincoln was polarizing because of his fidelity to the proposition that all men are created equal. That kind of polarization, based on unifying principles, is upside down today. Gallup tells us that the most divisive president in modern history is Barack Obama. The second most divisive? George W. Bush. What are we fighting over that can possibly compare to Abraham Lincoln’s war? We’ve already tried five years of President Obama’s approach to dealing with income inequality, and while big companies’ stock prices have gone up, the typical American’s income has gone down. Liberals’ determination to consolidate wealth and power in Washington exacerbates the income equality that liberals publicly decry.